Now that you’ve had sufficient time to recover from your recent overdose of all things ridiculous and heart shaped… it’s time for you to pull up a seat, sharpen your pencil, steal a couple glue sticks, and grab a lunchable [or maybe some of those pre-sliced apples in the little pouches designed for the world’s laziest moms]. Please clear your mind of all recent uncomfortable encounters, romantic endeavors gone awry, and anything else that might prohibit you from fully absorbing the knowledge I’m about to impart upon you. Open your eyes, your ears, and most importantly your hearts… because The Elephant’s School of Life is back in session. 1. Don’t be scared of braces. Because if your teeth are jacked up then you’re gonna have to deal with it at some point if you want to be socially acceptable. Except by that time, you won’t be covered under your parent’s insurance anymore, so you’ll be out six grand and 22 with braces. The moral: Get over it metal face. No one’s gonna even notice anything past the unsightly acne and oversized glasses on your face anyway. 2. Don’t start dating a psychopath, one so crazy, that you must runaway to Europe to hopefully be rid of him. It won’t work. He’ll come to visit you and wisk you off to Paris, where he’ll lose his wallet and force you both to wander around the red light district, all dressed up, without any money, or knowledge of the French language. Then you’ll get all deathly ill and it will start to hail. Unfortunately, he will still propose to you. You’ll say no, but he’ll have you keep the ring anyway in a lame, yet crafty attempt to get you to reconsider. But it won’t work cus you are smarter than that. When you finally come home, you will put the ring in your glove box so that you can bring it back because you are not a gold digging whore. However, in a random twist of fate, one of your “friends” will borrow your car and steal it before you have the chance. I guess there could be two three morals here: Don’t date a psychopath. Or let anyone borrow your car. Or have a glovebox. 3. Don’t accidentally use a long distance # to connect your dad’s AOL dial-up so you can instant message your high school friends all night long. Please understand that “FREE TRIAL” doesn’t also apply to the phone bill. Oh sorry, that one was kind of outdated. But I’m serious dad, I’ll cut you a check for that real soon! 4. If you should still find yourself dating a psychopath, [even after my strong warning against doing so] don’t runaway to Europe to get rid of him. Not only will that fail miserably, but you will end up meeting a new, even worse, British psychopath. The moral: If you have the choice between foreign and domestic psychopaths, always stick with American made. Keep American jobs here! So if there’s one thing that might force me to relinquish all respect for my mother, it would be that she loves Neil Diamond. And black licorice. Both, unforgivable offences. If you didn’t know, Neil made a guest appearance on tonight’s Grammies. I wasn’t warned of this, obviously. This gave me no choice but to switch to Bravo, where they were playing The Real Housewives of Orange County rerun-marathon that I now have memorized, which gave me no choice but to mute it and write this blog. I went and saw the movie “He’s Just Not That Into You“ on Friday. I have been living in anxious anticipation of this movie since I first picked up the book – one of three that I’ve actually read in my life. While I was watching it, I couldn’t help but reminisce on all of the unfortunate male mishaps I’ve had in my life, which there is not enough available space left on the internet to fully chronicle. Guys: this post is for your benefit. Just know if you do any of these things, no girl will ever be that into you. 1. White-tiger-internet-guy. Okay, so, remember when you were much younger and much stupider, and you and your friends put your profile on a dating site for the heck of it? And then out of nowhere some guy actually contacted you and wanted to meet forreal? And then you were super freaked out, but didn’t know how to turn him down? Oh, just me. Well, as the stars would have it, a charming young man would invite me to coffee. In the course of casual emailing, I had mentioned that I always wanted a pet white tiger. That may not be something that usually ever comes up in your casual conversations, but it would if you were talking to me. So I arrive, at a well-lit, public place (I was stupid, but cautious) and waddya know the moment I sit down, he hands over a stuffed white tiger. Okay. You better believe that one of my family members had a life-threatening emergency about 10 mins after he handed over the animal. 2. Underware-model-Wrigley-field-guy. I’m sure there’s alot of people who may over look certain flaws or potential sources of conflict in a relationship if the person is strikingly gorgeous or from a famous family. This would be underware model wrigley field guy. Indeed, nice to look at. Indeed, of noble blood. But let’s just make something drastically clear: if you check your reflection in a car window or talk about water weight on a regular basis – we’re just not going to last. An instant snapshot of our granola and jogging filled future popped into the forefront of my mind, and it was over. 3. Italian-gold-chain-guy. I love Italians. But as soon as they leave Italy, something just goes haywire. I myself, am Italian – but not that Italian. Orazio was his name. Orazio was one of the sweetest people on earth. He had a good job, and was to inherit his dad’s uber successful business. He opened doors, pulled out chairs, held the umbrella…all that good, but uneccessary stuff. But this poor guy was just too Italian. He wore a gold chain. And as soon as my eyes caught the first gleam of that blinding light, it was the beginning of the end. 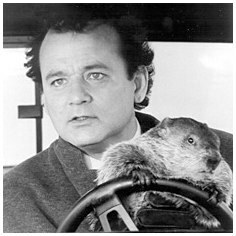 While watching one of my favorite movies of all time – Groundhog Day [starring my boyfriend Bill Murray], I felt a calling upon my life. If you haven’t seen the movie, I suggest you do that and then come back here to read the piece of wisdom which I have extracted from it. If anyone’s life is like groundhog day, it’s totally mine. I do the same thing every day. Every freakin day. I roll out of bed and sit down at my computer, oftentimes, without even getting so much as a sip of water or a box of ice cream. Many times, I do not even have to get out of bed because I simply grab my laptop off my nightstand and start my day. My blog is also in a rut. A rut of awesomeness. Just kidding. My readership is actually growing at an increasingly fast rate, which excites me, yes. Thank you to all you people who find comic relief at my expense. I’ve noticed something though. I have quite a few blog stalkers. Yes, stalkers. You people who lurke around but leave no trace of your presence. This brings me to my next point. There are quite a few of you out there who have some good blogs and/or websites. So good, in fact, that I would like to tell the world about them. Alot of you have asked about advertising, but since I’m not going to do any advertising until I switch to a website, I am going to do one featured blog or website every Friday. What does that mean for you? More readers, more exposure, and the recommendation of a widely respected Elephant. I have the uncanny ability to persuade people that said item [insert: blog, movie, dairy product] will change their life. How do I qualify to be the featured blog? When all you do is write for a living, you become a hermit by default. When I say hermit, I mean that I’m skeptical as to whether or not my car will even start due to how long it’s been sitting in my garage. Between the endless writing and working on my new business [which I hope to launch in the Spring but will not announce because as soon as there is a deadline I will crack under the pressure that only I have imposed upon myself] I have no choice but to sit in front of a computer all day, unshowered and in sweats. It’s really okay though, for I have found the secret to financial freedom is in not going anywhere. It’s 99.2% affective that you will not spend money if you don’t leave your house. I say 99.2% because there are those of you out there who will find ways to scam the system and buy things via the internet or Home Shopping Network. In which case, you are a lost cause anyway because you are attracted to things like Snuggies (or as the YouTube video below refers to them – the WTF blanket) and ShamWows. There is no hope of you ever saving money when you buy crap like that. Enjoy your lifetime of financial ruin. Today, I reached the breaking point; the point at which I had no choice but to leave the “den” as my friends lovingly refer to it. And I say lovingly because they too LOVE the den. There’s something magical about my room that forces people to be lazy, maybe it’s the fact that I allow nothing other than ambient lighting. In fact, I don’t think any of my friends have sat on my couch. As soon as they enter the door, they head straight for the bed, where they can be assured to view mindless daytime TV, feast on an assortment of leftover holiday chocolates conventiently located on the nightstand, and check this blog from my laptop to see how I embarrassed them recently. When you enter my life as an acquaintance or luckier yet a friend, you run the risk of me publicizing your life in any way I see fit. And usually, the way I see fit is to make a mockery out of it. OK. Will you stop distracting me? Anyway, today I realized that I’d eaten everything in my fridge except a very questionable rotten pomegranite and some Ferro Rocher’s in the shape of a Christmas Tree. I had to leave. So I went to the grocery store and just as I suspected, I spent money. If I would have just stuck to my plan I’d still be on top of the game. So now that I have offically conducted a double blind experiement of my hypothesis, I will be re-writing this cost saving plan into an e-book, which will be available for purchase on my website.